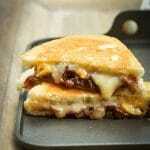 Turn sweet Vidalia onions into a rich jam with this quick and easy Grilled Cheese with Vidalia Onion Jam recipe. I learned of her death early Monday morning from one of her distant family members. She shared with me that my friend — who I always knew to be upbeat, positive, engaging and entertaining — had been suffering from depression, something that I suspected but didn’t know for certain until now. I’ve thought a lot over the last few days about what I knew of Sarah-Jane’s life in the time we were together and what I know about my own life. I can’t and won’t speculate about what was happening in her heart and mind in the days leading up to her death. I can only say that I’m going to miss seeing her at conferences and that I’m praying for comfort for her family that knew her best and loved her most. 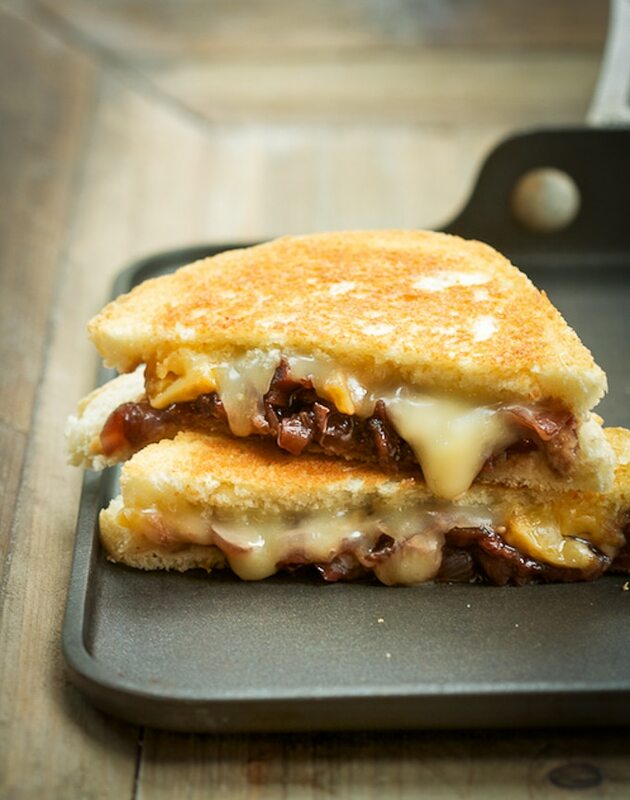 I had intended to share this Grilled Cheese with Vidalia Onion Jam today with an update on how our “Let’s Do This, This Summer” list is going. But I’ll save that for another day. Today, I’ll simply share this recipe in honor of Sarah-Jane. It’s a unique southern spin on a classic, just like she was. Heat butter and canola oil in a large Dutch oven or skillet over medium-high heat; add onion and saute 10 minutes or until lightly browned and tender. Add strawberries, water, and vinegar; bring to a boil. Reduce heat and simmer, covered, 10 minutes. Uncover and simmer an additional 10 minutes or until thickened. Let cool slightly. To assemble sandwiches, smooth a scant teaspoon of butter over one side of each bread slice; top other side of 8 bread slices evenly with about 1/4 cup of jam. Layer evenly with cheeses and remaining bread slices, buttered side up. Heat nonstick griddle over medium-high heat. When hot, turn down heat to medium and grill sandwiches 5 minutes on each side or until golden brown. The news of Sarah-Jane’s passing left a hole in my heart this week as well. A sad day for all of us in the nutrition world and those of us who knew her well. She will be missed. She continues to pop into my mind as this reality sets in. Not seeing her at conferences in the next few months is going to be tough on all of us. Thanks, Regan. This is a perfect tribute to our amazing colleague. I am still in disbelief and devastated by her death. I think I’ll make this comfort food recipe in her honor.